Baseball season begins in a month. Spring Training games began last week, but the real news is that regular season baseball is just four weeks away. This Saturday night, I will be previewing the National League West division, after previewing the East and Central divisions each of the past two weeks. ​I don't believe in correlation without causation, but the fact that the Giants won the World Series in 2010, missed the playoffs in 2011, won the World Series in 2012, missed the playoffs in 2013, won the World Series in 2014, and missed the playoffs in 2015 is fairly interesting. The Giants appear to retool every other year to then subsequently win the World Series. And boy did they retool this offseason. San Francisco added Johnny Cueto, Jeff Samardzija, and Denard Span over the winter, deepening both their rotation and lineup. On the offensive side of the ball, the Giants boast the likes of Joe Panik, Buster Posey, Brandon Belt, Hunter Pence, and Matt Duffy, as well as Span, to give them a great order from the top to the bottom. This was a team that posted the second-best wRC+ in baseball without Span, so 2016 should be a similarly good offensive year for the team. The Giants' downfall came in their rotation last year. As a group, that unit was worth a total of 7.2 fWAR, sixth-worst in the Majors. With pitching that bad, I'm actually surprised that the Giants played as well as they did last year. The front office obviously noticed the same issues, and they pounced. Cueto and Samardzija now give the Giants a much improved rotation that also includes Madison Bumgarner, Jake Peavy, and Matt Cain. This improved pitching, plus the fact that it is an even year, should carry the Giants to a division title. I guess I still haven't learned my lesson, have I? I've always been high on teams that are considered the bigger winners of the offseason and then they falter and do not reach expectations. The Diamondbacks are different, though. They did something similar to what the Cubs did last offseason. The Diamondbacks took a young core in the form of Paul Goldschmidt, A.J. Pollock, David Peralta, and Patrick Corbin and supplemented to it. That's different than the 2015 Padres, for instance, who basically built their team through free agents and trades. The Diamondbacks built their team, and now they are supplementing it. This is why I think this will work. Who were those additions, you ask? Well, their biggest came as a huge rotation upgrade. Zack Greinke will now be leading a Diamondbacks' staff that also includes fellow new addition Shelby Miller, as well as Patrick Corbin, Rubby De La Rosa, and Robbie Ray. The rotation was a place of struggle for Arizona last season, and they definitely made the necessary moves this offseason to give them one of the more formidable staffs in baseball. Their bullpen, too, got an upgrade. This time it comes in the form of Tyler Clippard, who will serve as a nice bridge to closer Brad Ziegler. Last season, the Diamondbacks ranked 27th in fWAR from pitchers. In the lineup, the Diamondbacks supplemented Goldschmidt, Pollock, and Peralta with Jean Segura. They hope Segura can find his bat in 2016. If so, he'll be an extremely good upgrade in the middle infield. Arizona also needs Yasmany Tomas, Jake Lamb, or Nick Ahmed to step it up in 2016 in order to make up for the loss of Ender Inciarte. The Diamondbacks will be on the cusp of making the playoffs, but if everything goes well for them, I wouldn't be surprised if they are still playing come October. It appears that the Dodgers have an unlimited amount of funds, but they still could not get David Price or Zack Greinke to sign with them in free agency. Even a deal with Hisashi Iwakuma fell apart, leaving the team to settle for deals with Scott Kazmir, Kenta Maeda, and Yaisel Sierra. The Dodgers won the NL West in 2015, but this was partly because their pitchers combined for the second-highest fWAR total and fifth-lowest ERA in the Majors. In 2016, where are the Dodgers going to get their pitching? Greinke, who was worth 5.9 fWAR, is gone. The Japanese Maeda is something of an unknown. Hyun-jin Ryu missed the entire 2015 season with a torn shoulder. Clayton Kershaw is the only anchor in this rotation. If it works out, more power to them. But, I'd rather have the Diamondbacks' Greinke, Miller, and Corbin in a three-game set as compared to Kershaw, Anderson, and Kazmir or Ryu. On the offensive, the Dodgers should be just fine. Their lineup posted the third-best wRC+ in baseball last year, and it should be even better this year with a full season from top prospect Corey Seager. Adrian Gonzalez, Joc Pederson, and Yasiel Puig are the heart of a power-heavy order that is among the best in the league. The Dodgers still have the firepower to make a run deep into the postseason, but their pitching remains a question mark. The Padres' 2015 season was nothing short of a disappointment. The team put all their chips on the table last offseason, acquiring Matt Kemp, Wil Myers, Justin Upton, Derek Norris, James Shields, and Craig Kimbrel via trade and free agent signings. Despite all those big names, the Padres were actually worse in 2015 than they were the prior year (77-85). Kimbrel and Upton are gone, but the Padres seem to be in between fully rebuilding or trying to contend. This uncertainty will lead to another subpar season. Perhaps the biggest offseason acquisition for the Padres was the hiring of new manager Andy Green. He has never managed at the big league level, last serving as the Diamondbacks' third base coach, but needs to spark this team and develop a chemistry that they did not have last year. The Padres' offense got additions in the form of Jon Jay and Alexei Ramirez this offseason, but the loss of Justin Upton in the middle of the order will hurt. Even with Upton posting a 122 OPS+, San Diego was in the bottom third in baseball in wRC+. They can be better this year if Norris can improve on his 99 OPS+ in 2015 and if Ramirez serves as a true upgrade over Alexi Amarista at shortstop (which he should). In the pitching department, the Padres shouldn't be terrible. Their staff actually posted the eighth-best xFIP in baseball and top-three starters, Tyson Ross, Shields, and Andrew Cashner, all return. In the bullpen, Fernando Rodney takes over as closer. If the Padres want to beat this projection, they need their offense to pick up the slack. It's hard to see that happening, when the team appears to lack a real direction. The Rockies want to contend, but I just don't think that is possible. It may happen sooner rather than later, however. In 2016, the Rockies indirectly proved that they wanted to contend, signing Gerardo Parra and acquiring Jake McGee from the Rays to upgrade their lineup and bullpen, respectively. This team won just 68 games in 2015 and is not complete or deep enough to make any real noise in the National League this upcoming year. I am a fan of the Rockies lineup heading into the season. Charlie Blackmon, D.J. LeMahieu, Carlos Gonzalez, Nolan Arenado, and the Coors Field effect should give the Rockies one of the higher scoring offenses in the National League. Last season, though they did have Troy Tulowitzki for the first half of the year or so, the Rockies scored the fifth-most runs in baseball. The only issue with the Rockies is their pitching. That's a pretty major issue, to be fair. Colorado's projected rotation consists of Jorge De La Rosa, Chad Bettis, Jordan Lyles, Jon Gray, and Tyler Chatwood. De La Rosa and Bettis each posted ERA+s over 100 (considered average). The bullpen should be improved, because the Rockies also added Jason Motte and Chad Qualls to go along with McGee. It's hard to know how much of a difference all these moves will make, but the Rockies probably won't be in the conversation in the National League this year. Using Baseball Prospectus' playoff odds, you should be able to tell who has the best chance of doing just that. Teams really should take those odds to determine whether they should be buyers and sellers because more often than not, they are right. After games being played on July 6 last year, five of the ten eventual postseason teams had a 80 percent chance of making the playoffs or better. Every team that did have an 80 percent or greater chance of making the playoffs on this date last year did. The team with the highest percent chance to make the playoffs on July 6 that ultimately didn't was the Milwaukee Brewers, who had a 71 percent chance to punch their ticket, but collapsed down the stretch and failed to make it. Only three (Orioles, Royals, and Pirates) had less than a 50 percent chance of making the playoffs following action on July 6. By July 31, the Orioles were up to a 71 percent chance, the Royals were at a 17 percent chance, and the Pirates were at a 46 percent chance. Knowing this, I will use Baseball Prospectus' current postseason predictions to determine who should buy and who should sell at the 2015 Trade Deadline. There's no reason why the Cardinals, who own MLB's best record at 54-28, should consider selling. In fact, Baseball Prospectus says that they have a 99.3 percent chance of making the playoffs, leaving just a very small chance for an extreme collapse. If the Cardinals play just .500 ball the rest of the way, that would put them on pace for 94 wins, which would definitely put them in prime position to punch their ticket to the postseason. The Cardinals have no reason to do anything but buy. The Dodgers have the second-highest playoff percentage in the league, and nothing suggests that this team won't buy at the trade deadline. I predicted them to go out and get Johnny Cueto, perhaps the best pitcher available not named Cole Hamels. The Dodgers are always willing to spend money and prospects to make their team better and can easily justify doing so at the deadline. The Nationals have arguably not played their best baseball yet, but still have an 85.6 percent chance to make the playoffs. They could use some reinforcements in their bullpen, but most of the additions the Nationals will be getting will be players coming back from injury, such as Jayson Werth, Ryan Zimmerman, and Stephen Strasburg. They may not need to make a ton of moves in July, but if they do, they have good reason to do so. The Astros have already shown interest in some of the top pitchers that will be available, and Baseball Prospectus' playoff odds completely backs that up. Houston's playoff percentage, at 84.7 percent, is so close to 85 percent that I had to shove them into this category. The Astros have showed that while they are a bit of a surprise, they still can win ballgames and do it over a period of time. The Astros by no means are "pretenders," as they have been able to hold a comfortable AL West lead since late April. The Pirates and Cubs have a case of some serious bad luck. They are playing in the National League's toughest division and would be either leading or close to leading any other division in the league. The only reason I'm wary of either of these teams buying at the deadline is because they are not division leaders and have more of a chance to collapse and fall out of the playoff race altogether. Unless they believe they have a real shot at the Cardinals (which it appears they don't), they shouldn't completely unload their farm systems to go out and get the best guy on the market. Of the three teams in this category, I am most comfortable with the Royals buying at the trade deadline due to the fact that they lead their division by a comfortable margin and need just one or two pieces to really put the pressure on the rest of the division. All signs point to the Royals making the playoffs again this year, so I would go ahead and pencil them in as buyers at the deadline. The Angels are in a good position right now. They are playing good baseball and have shown the need for an upgrade in left field. Of the teams listed in this section, I truly believe they are the best and most complete team, so therefore they should be buyers at the deadline. The Angels could use some rotation help as well, but if they patch up a few spots, they will get into the postseason. My verdict? They should be buyers. The American League East division is lumped together because the division is so muddled and close that really anyone could win it. Baseball Prospectus' simulations give the Yankees the best chance to go to the playoffs out of that division, but with some rotation help, the Blue Jays are the division's best team. The Yankees and Rays should stand pat or make small moves at the deadline, while the Blue Jays should go out and make a splash for a rotation piece. With Miguel Cabrera being sidelined with his hamstring injury, I'm going to pencil the Tigers in as should be sellers, but as this team continues to try and make a run once again, they will find themselves trying to buy. The Tigers are heading towards a Phillies-esque fall, and if they don't realize that soon, it could only get worse if they decide to buy at the trade deadline in hopes for one last run at the World Series. Even if the Mets added an offensive piece, I don't think that would be enough to get them to the playoffs this season. With that said, however, I could see them dealing for a guy with more than one season of control, as their young and talented pitching staff comes into their own. The Mets couldn't justify buying for a rental player, but a guy who is at least signed through 2016 could make sense. The Baltimore Orioles have a ton of free agents at the end of the season that they probably should move. The Orioles could be one of those teams that tries to get 25-man roster guys with more years of team control in return. The Orioles could be a team that buys and sells at the trade deadline, and I would be fine with that. It's an odd year. The Giants aren't good enough to win the NL West, and considering that they have to deal with the Cubs and Pirates for the Wild Card, it will be tough for them to really make a run into the postseason. However, they still have a good core group of guys and the team has proved me wrong before. They probably should stand pat. The Twins just aren't that good. Sure, they had a good run earlier this season, but all the numbers suggest that they were going to fall out of first in the AL Central. The Twins should really try and go for 2016, when some of their rookies will be more polished. While the Rangers shouldn't buy, they probably will, as I consider them to be in a similar boat as the Tigers are in. The Rangers could legitimately contend, but they would more than a couple of upgrades, to the point where they probably shouldn't go for it this season. The Indians were a popular postseason pick prior to this season, but Baseball Prospectus' simulations show that they would need some serious luck to actually get there. The Indians shouldn't sell any pieces other than the impending free agents because my gut says that they will be back in the postseason sooner than later. The Red Sox are in a tough position right now. It might not be time for a fire sale quite yet, but it's definitely not time to go out and try and contend this season. The Mariners have had some issues staying in the race this season, and while they shouldn't sell off their entire team, they really shouldn't be buyers either. The Athletics are already shopping their pieces and it looks like they will be sellers. The Diamondbacks are a team that should stand pat. They still have pieces to contend in the near future and as their pitching improves with guys coming back from injury, they could be a legitimate contender coming 2016. The Braves, especially in the offseason, have committed to becoming a selling team. They don't have any exciting pieces, but even though they have kind of surprised, they should by no means buy. The White Sox are in a tough position. They reportedly won't have a fire sale, which makes sense considering how much money they spent in free agency, but they need to get rid of Jeff Samardzija and still be planning to try again in 2016. The Padres could buy at the deadline, but in all reality, they shouldn't. They've got some important games coming up that they need to win if people start seriously seeing them as contenders. Once again, they are proving that the winners of the offseason don't necessarily win during the season. The Marlins shouldn't go into a fire sale, but Mat Latos, Dan Haren, Brad Hand, and other free agents at the end of the season should be gone. The Reds have Johnny Cueto, Mike Leake, and possibly Aroldis Chapman available, and while they won't sell until after they host the All-Star Game, I expect it to come, as it should. I'd pull the trigger and deal Troy Tulowitzki. It's time for a real change in Colorado if they want to be relevant down the road. The Brewers should enter into a fire sale. Now, these rankings and categories don't mean that each of these teams will do as I advise. Their postseason percentages could change and perhaps an addition is all they need to do that. However, Baseball Prospectus' odds are very accurate and should not be taken lightly. Teams really should use them to determine whether they could justify buying at the deadline. Jeff Samardzija has been in this position before. Last season at this time, Samardzija was nearing the end of his career as a member of the Chicago Cubs. He was dealt to Oakland in a multi-player deal in July. At the time of his trade, Samardzija was one of the best pitchers in the game. He went 2-7 with a 3.03 ERA with the Cubs last year, striking out 100 as opposed to 29 walks in 101 innings. This time around, Samardzija is in a bit of a different position. He is a member of a Chicago organization -- this time the White Sox -- but is not pitching nearly as well. He's 5-4 with a 4.53 ERA through 101.1 innings. Despite those "ugly" numbers, Samardzija has had some particularly bad luck, as his 3.67 FIP suggests that with some better defense his ERA would be nearly a run lower. His 84 to 17 strikeout-to-walk ratio also is an indication that things will turn around. Samardzija has been hurting from a .338 batting average on balls in play, 39 points higher than his career average. Again, with some better defense Samardzija is just as good as he was last year. When the White Sox, who were one of the bigger spenders this offseason, decide to rebuild following their 32-40 record through their first 72 games, Samardzija should be the first to go. For teams in the market for starting pitching, like the Astros, Blue Jays, Yankees, Giants, or even Dodgers, this has to be a welcome sight. Samardzija might be the most valuable addition for any club this trade deadline season. First, he's a free agent this offseason, which means that if the White Sox do decide to move him, he'll be cheaper for acquiring teams than if he had more years of team control. Second, his numbers aren't stellar. Any team could point to the fact that his 4.53 ERA should keep them from giving up very many top prospects in any deal. Third, the saber stats do show that, with better defense, Samardzija can be an ace in any staff. So, to recap, a team could be getting a free agent to-be at a discounted price due to poor performances and could end up getting an ace out of it. He may not be Cole Hamels or Johnny Cueto, but he's ready to become a key member of a new pitching staff for a contender down the stretch. His name is Jeff Samardzija and your team should go out and trade for him. When Jon Lester was closing in on signing, the speculation was astounding. Some were believing that the Red Sox and Cubs were finalists, others were saying Cubs and Giants, with some even saying Dodgers and Red Sox. The Lester ordeal was a real eye-opener, showing how much social media has changed the way we get and distribute baseball news. Without further ado, here are the winners and losers from the Winter Meetings. When Lester signed with the Cubs, we knew that they had achieved their ultimate goal of the offseason. And now, they are among the best in the National League, with a chance to make the playoffs for the first time since the 2008 postseason. Jon Lester is that type of player. He is the guy you want in a Game 7, a postseason clincher, or any other big game. No, I'm not talking about James Shields, I'm talking about Lester, who has a 2.57 ERA in the playoffs, as a two-time World Series champion. But it isn't just Lester that makes the Cubs the winners of this Winter Meetings. They made one other move, much more strategic and a lot less prevalent, acquiring Miguel Montero from the Arizona Diamondbacks. The Cubs have needed catching, finishing second in the Russell Martin bidding, and the acquisition of Montero fits the bill. He's under team control for three more years and posted a 1.2 fWAR in 2014. The Cubs can surround Montero and Lester with their prospects and have a shot at the postseason. Move to the south side of Chicago, where we find our other Winter Meetings winner. The Chicago White Sox played both the free agent and trade markets well. They acquired Jeff Samardzija from the Athletics in a six-player deal and now they boast a rotation of Chris Sale, Jose Quintana, Samardzija, and Jon Danks. Samardzija makes the White Sox rotation look like a contender's rotation, and now their team looks like it could be a contender. The White Sox also added David Robertson to their relief corps that were highly inexperienced last season. Him and Zach Duke represent their transactions of relief pitchers this offseason, which helps to evolve a White Sox bullpen that previously didn't have anyone over the age of 27 in it. Duke and Roberston add experience and talent to a now-interesting Chicago team. Dee Gordon, Howie Kendrick, Matt Kemp, Yasmani Grandal, Andrew Heaney, Enrique Hernandez, Brandon McCarthy, and Jimmy Rollins. What do all those names have in common? They were all involved in either a trade or a signing with the Dodgers. President of Baseball Operations Andrew Friedman kempt (sorry, bad pun) himself busy during these meetings, wheeling and dealing with the Phillies, Marlins, Angels, and Padres. I'm not even sure who is on their roster anymore. What makes the Dodgers a winner, you ask? They were able to unload one of their big-time outfielders (Kemp), while getting a young, promising catcher, something they needed, in return. They traded Dee Gordon, who posted a poor .648 OPS in the second half for Andrew Heaney, Chris Hatcher, and Austin Barnes. Heaney's career with the Dodgers didn't even last 12 hours, as they filled their hole at second base with an even better option than Gordon in Howie Kendrick, who, at 31, is among one of the better all-around second baseman in baseball. Oh yeah, they also signed Brandon McCarthy and traded for Jimmy Rollins, too. The Dodgers upgraded their outfield, catcher, shortstop, and rotation all in the matter of 24 hours. Once the Miami Marlins signed Giancarlo Stanton to that big $325 million extension, I really wasn't sure if the Marlins thought they could be contenders, or if they just wanted to keep that gem they had in Stanton on their roster. After these Winter Meetings, I can definitely see that the former is true. They acquired Dee Gordon and Mat Latos at the Meetings, and while someone could argue that they gave up a lot, they are finally showing that they want to go all-in in 2015. Or at least have a shot at contending. The Marlins starting eight looks like this: Christian Yelich, Marcell Ozuna, Giancarlo Stanton, Casey McGehee, Adieny Hechavarria, Dee Gordon, Garrett Jones, and Jarrod Saltalamacchia. Their rotation? Jose Fernandez, Henderson Alvarez, Mat Latos, Nathan Evoldi, and Jarred Cosart. Now you tell me, do you think the Marlins are contenders? I would say definitely. By acquiring both Gordon and Latos at the Meetings, Miami ownership proved to the baseball world that they want and are wiling to play meaningful baseball for the first time since 2003. I'm still confused as to what the Giants really want to accomplish in 2015. The best move for San Francisco at the Winter Meetings was getting Madison Bumgarner on the cover of Sports Illustrated after winning the Sportsman of the Year award. In all seriousness, I think you have to attribute some of the Giants' offseason success, or lack there of, to just plain old bad luck. They finished third for Lester, second for Yasmany Tomas and Pablo Sandoval. But any good Giants fan would tell you that they finished first in the most important category. I'm still trying to understand where the Giants plan on spending the money that they were planning to give Lester, Tomas, or Sandoval. Could they go after a guy like James Shields? That would be interesting. Whatever the case, the Giants did not get better at the Winter Meetings. I guess that means San Francisco fans should just start watching the team again in 2016, the next even year. The Orioles have lost Nelson Cruz, Nick Markakis, Andrew Miller, and now perhaps their general manager, Dan Duquette. It was rumored last weekend that Duquette might soon be on the move to Toronto to become the Blue Jays' CEO, but it was later reported that the Blue Jays would reconsider until after the 2015 season. Regardless, Duquette has to deal with a mess in Baltimore. Three months after winning the AL East, they lose Cruz and Markakis, two of their top performers from the season. The Orioles usually stay relatively quiet until later into the offseason anyway, so they might be able to salvage a good piece of what they lost with mid-tier free agents. But for now, their Winter Meetings weren't good, and they need to find a plan to get back to the top of the American League East, a division where the Blue Jays and Red Sox have already gotten better this offseason. 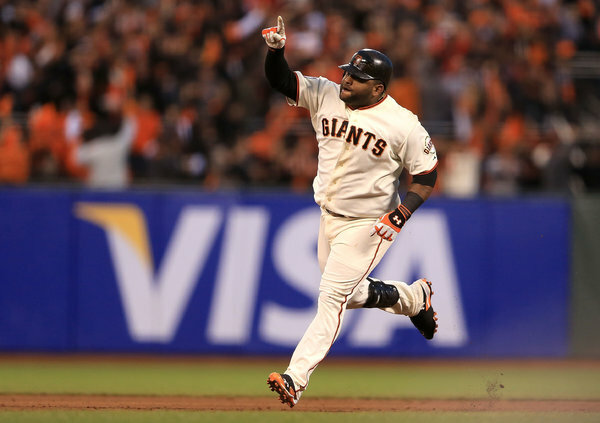 Free agent third baseman Pablo Sandoval appears to be closing in on signing with his next team. He reportedly will be making a decision next week. It's been an interesting ride thus far for Sandoval as three teams have emerged as the favorites in the bidding. The Giants, Red Sox, and Padres are the three main teams interested in Sandoval's services. They each have made their bids. The Red Sox reportedly had the highest bid coming into today, offering Sandoval a five-year, $95 million contract. The Padres made their offer to the third baseman today and reportedly made the "high bid" for Sandoval. The Giants' contract offer details haven't been reported, but they are still making a push for Sandoval as well, leading to what looks to be an interesting coming week. Contract negotiations for Sandoval are likely to reach over $100 million, especially if the Padres topped the Red Sox five-year, $95 million deal today. Sandoval was only a 3.0 fWAR player in 2014, and at age 28 with his weight, he may start declining within the next couple of years or so. Sandoval hit 16 homers in 2014, which was his most since 2011. I don't know if Sandoval is worth $19-$20 million per season. At the end of last offseason, Dave Cameron of FanGraphs wrote an interesting article on how much money was invested per win. He found that the average player was given about $7 million per win, while the median player was given $5.9 million per win. Based on the Red Sox' offer to Sandoval, he'd be paid about $6.3 million per win, which could be considered a steal based on the average. But Sandoval won't be improving over the next five seasons. I'm not sure if a $100 million commitment to a 28-year-old, 245 pound third baseman is the right thing to do for any of these three teams. I think that when we look back at this deal, we will see that the negatives outweigh the positives. Don't get me wrong; Sandoval is a good player. But does a "good" player deserve $20 million a year, a deal usually reserved for an absolute stud? In 2014, twenty-two players were paid $20 million or more. Cole Hamels, Zack Greinke, and Felix Hernandez were absolute studs. They all made over $20 million. Vernon Wells, Ryan Howard, and Prince Fielder also made over $20 million. Wells wasn't on a team, Fielder was injured for most of the year, and Howard was, well, Howard. When we look back at the Sandoval deal five years down the road, will we see a Jayson Werth deal or an Albert Pujols deal? I don't think either is a guarantee. When Werth signed his seven-year, $126 million deal with the Nationals, he was older than Sandoval (31), but had posted a 4.9 fWAR the season before. His contract with Washington guaranteed him an average of $18 million a year, and since signing, Werth has posted fWARs of 2.3, 0.6, 4.6, and 4.8, respectively. He is still guaranteed to be in a Nationals uniform for three more years, but he has been very good. Sandoval is in a different situation than Werth. He's three years older, but didn't produce as well in his contract year. Sandoval might be projected to regress faster than Werth, who still has shown the ability to get on base, hit, and hit for power. I am mixed on the rumored deal for Sandoval. I really think it comes down to how much a team is willing to spend over how many years. I think a five-year deal is right on the money for him, but a contract could be over $100 million, which would make him amongst the richest in the major leagues. I don't know if he is worth it. We will find out soon enough. Or in five years. Whichever comes first.